In my last post about small spaces, I talked about how we made more storage space before the house was built. Today I want to talk about making more storage space after your house is built, because this is probably much more applicable to all of you. After three years of living in this condo, it was stuffed to the gills. With the addition of a baby, we just needed more storage space. We had hoped to sell our home before the baby came along, but when it didn't sell, we were forced to turn every bit of unused space into storage space. We bought the materials at home depot, they cut all the boards for free, my dad drove up for the weekend, we borrowed a table saw, and I painted it with the free white touch-up paint that our builder gave us when we moved in. 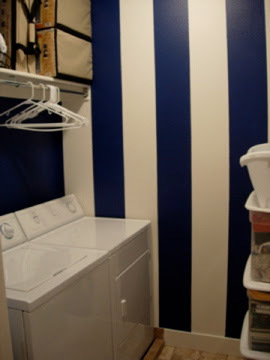 Now we have a customized laundry room, all for around $150. By using all the empty and unused space above the washer and dryer, we now have a place to store all my paintings (of which there are a lot, as you can see), diapers, toilet paper, the sewing machine, laundry detergent, and bunch of other things that didn't have a home. Most of these used to sit on the floor, and there is nothing worse than watching your floor space shrink by the day as more things get stacked next to each other. So not only do you not lose square footage, you also increase the value of your home with off-the-ground storage space. Win-win. Now, if you don't have a handy-man dad like me that can build an entire shelving unit from scratch, home depot has a lot of pre-made shelving units that pretty much only require a screwdriver and a hammer to install. IKEA also has complete storage systems, or even simple single shelves you can easily install and create extra storage space. And all of it is really pretty cheap. Having a small space is no excuse not to be organized, have food storage, or have plenty of storage space. All it takes is a little creativity and a few nails. I love this post! It's just what I needed. I don't have a laundry room, I have a laundry closet...literally. I open the door which immediately bumps into the water heater because oh yeah, our laundry room is also our utility room. When I want to open my front facing dryer I have to step back, swing open the door, then I can move forward to pull the laundry out. All we had when we moved in was the same as you, one shelf and one hanging rod and I've desparately wanted to do something with the storage in there but didn't know what to do until your post. Thanks for the inspiration! Looks great, and I really like your stripes. My laundry room can definitely use an overhaul, but it is pretty far down the list.